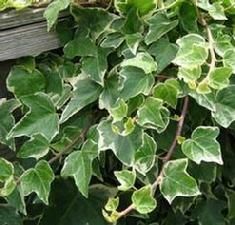 An artistic variegated ivy, the small 3 to 5 lobed creamy white leaves are attractively painted with varying shades of green. Plants will grow to 4-6” as a ground cover or climb a wall or trellis to 20’. An excellent choice for Ivy topiaries or container plantings. Prefers loamy soil and average moisture. Provide partial shade and protection from winter damaging wind.